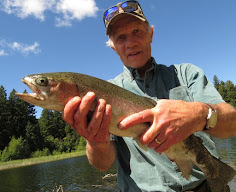 On Fathers Day, June 21st the Nicola Valley Fish & Game Club (NVFGC) held their traditional BC Family Fishing Day event at the children lake located between the Kentucky and the Alleyne lakes. Despite the cloudy weather with the occasional rain and drizzle, it did not deter families from attending. By 11:00 am over 50 adults and 59 children had signed up at the registration booth. While the weather might not have been the usual sunny and hot it certainly was perfect for fishing. 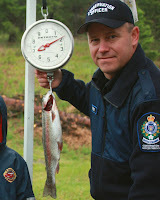 By the end of the event over 120 rainbow trout had been weighed in with the heavier ones exceeding two pounds. Neither did the weather negatively impact on the excitement, joy and determination of the many young fishers. The enthusiasm of the children and the joy they felt spending quality time with their parents and family on the lake had everybody in a good mood. According to Bill Otway, the organizer of the Family Fishing Day for the Nicola Valley Fish & Game Club, this year’s event has been one of the most successful since the club started to host the Family Fishing Day. Of course an event of this proportion would not be possible without the numerous hard working volunteers and members of the NVFGC and the many supporters from the Merritt business community. A big thank you to the Credit Union, Powderkeg Outdoor Supply Store, Ponderosa Tackle and Archery, Tim Hortons, McDonalds and many other individuals for donating prizes, tents, time and money to make this event possible and the success it was. The local Conservation Officer detachment was present during the entire event providing assistance and showing children how to clean fish. The Conservation Officers also provided over 40 rod and reel combos plus other smaller prizes and gifts to be given away to the children that took part in the fishing derby. There were other prizes to be had as well; making sure that no child was left out. In the cozy refreshment tent the ladies of the NVFGC were busy providing hot coffee, donuts, grilled hamburgers and hot dogs for the hungry fishers and spectators. All in all this was a great event shared by many families and everybody had a good time. The BC Family Fishing Weekend purpose is to promote new fishing opportunities and British Columbia as a world-class fishing destination. For this special family event no fishing license was required and the lake had been stocked with additional fish. The NVFGC is proud to be the annual host of the Family Fishing Day and we look forward to next year’s Father’s day event. The NVFGC is a family orientated conservation and sportsman organization offering many events throughout the year for its members. Membership applications can be obtained at the Powderkeg Outdoor Supply Store in Merritt. That's really nice Othmar - great family fun! Thanks for sharing. Yes Heidi and I had a great time with all the kids. It let me forget the pain and discomfort I am experiencing since the surgery for a while.